Throughout the year we’re exposed to a variety of awareness campaigns. For example, Breast Cancer Awareness Month (October), American Heart Month (February), and National Safety Month (June). While public awareness campaigns are important for helping us better understand a situation or fact, there is another level of awareness that is often overlooked: self-awareness. Consider self-awareness the foundation to your life. It is a crucial (yet often missed) first step for processing information and learning how to make decisions and take action. If you lack clear self-awareness, that is, if you don’t know your personality, strengths, thoughts, beliefs, motivations, and emotions, then do you really know if the decisions you are making are aligned with your best self? So how, then, do you consciously decide to do something (or stop doing something), and what do you do if you want to, but think you can’t? In this three-part blog series our board certified Health and Wellness Coach, Laura will teach you how to improve your self-awareness to help you make better decisions and take action. Do you ever stop and think (like REALLY think) about what makes you, YOU? Or more specifically, why you do certain things and not others? For example, why do you brush your teeth every night? Why do you follow the law? Why do you show up to work on time? Why is self-awareness important? Because who you are is going to influence your thoughts and every decision you make. It will also impact how you feel mentally and physically. The more you begin to learn about yourself, the more you will be able to understand why you do things and how you can change them. With self-awareness you can begin to uncover your subconscious thoughts, improve your decision making, and foster your physical and mental health. Most daily functions stem from automatic or unconscious thought patterns.1 Do you ever find yourself wondering if you just blew through that red light? Self-awareness gives you the ability to act in a more conscious way because it helps you get to know what your unconscious mind is up to. 4 The more self-aware you become, the more you will start to realize how your thoughts and behavior patterns are aligned with who you want to be. Self-awareness provides you with invaluable information that can be used to guide your life in the direction you desire, which allows you to work towards making your dreams come true. Rather than reacting to external pressures and impulsive desires, self-awareness gives you the ability to slow down and react in a way that aligns with your best self. Prior to starting a journey to improved self-awareness it is important to be informed of the challenges you might encounter. Self-awareness activities require you to think deep within yourself. This type of introspection can bring up past trauma you are not ready to face. It can also stir up a variety of emotions including fear and self-judgement. While fear and judgement are common human reactions to increased self-awareness, they shouldn’t discourage you from continuing to learn more about yourself. Growth and change will almost always bring discomfort, but in the midst of this difficulty it is important to remember that learning more about yourself is a big step towards reaching your full potential. So where do you start? We recommend you begin your journey to self-awareness by identifying core components of yourself including Values, Strengths, Weaknesses, and your Self-Vision. Below you will find a list of basic self-awareness questions you can use as a starting point. Block off 20 to 30-minutes to think through your answers thoroughly (that’s 20-30 minutes to work towards your best self, you can do it!). Remember, there are no right or wrong answers. What things do I value most in my life (list them all out)? Select the top five values from your list. Why did you choose these over the others? What things am I good at (strengths)? For the things you are good at, what about those things do you enjoy? What things am I not so good at (weaknesses)? For the things you are not so good at, is it important for you to improve? Why? For each, what about those things makes you happy? Are you experiencing enough of these? For each, what about those things makes you sad? What things am I doing to live my life in this image? What things are preventing me from living my life in this image? 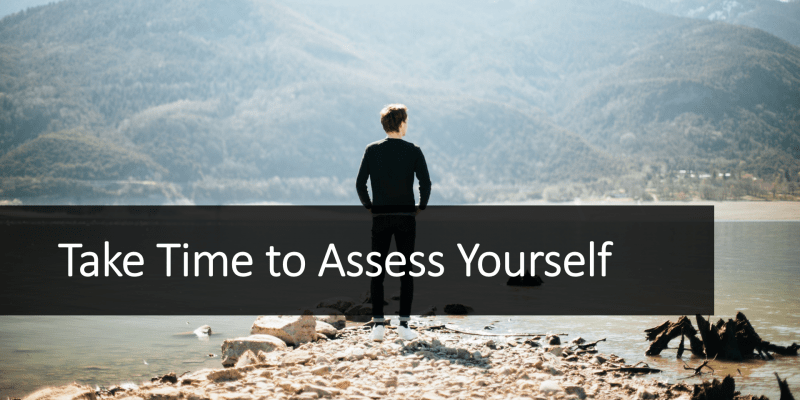 When you are ready, try assessing yourself in a more specific area. You can assess your current behaviors (or things you want to be doing) to identify the gaps between your current and desired self. Identify a common behavior to see if it lines up with the answers to your self-assessment questions. This information will help you form decisions for change and ultimately motivate you to create and implement an action plan. In our next post you will learn how to apply self-awareness questions to decision making and behavior change. You can subscribe to our Twitter and LinkedIn to be notified when these posts are made available. (1) Powered by Intuition. 10 Powerful Reasons To Increase Your Self Awareness. https://​www.poweredbyintuition.com​/​2012/​02/​19/​10-powerful-reasons-to-increase-your-self-awareness/​ (accessed November 2, 2017). (2) Furnham, A. Self Awareness: How self aware are you? Do you know how you come across? https://​www.psychologytoday.com​/​blog/​sideways-view/​201511/​self-awareness (accessed November 2, 2017). (3) WebMD. 10 Health Problems Related to Stress That You Can Fix. https://​www.webmd.com​/​balance/​stress-management/​features/​10-fixable-stress-related-health-problems. (4) Positive Psychology Program. Why Self-Awareness Matters and How You Can be More Self-Aware. https://​positivepsychologyprogram.com​/​self-awareness-matters-how-you-can-be-more-self-aware/​ (accessed November 2, 2017). Laura is a Certified Health Coach (MS-HWC) and has a strong background in corporate wellness programs and health promotion. Her knowledge of health and wellness on both an individual and group level makes her a well-rounded expert in the competitive fields of Corporate Wellness and Health Promotion.